A guy got exactly what was coming to him when a driver used his motorcycle to try and stop him robbing a car. 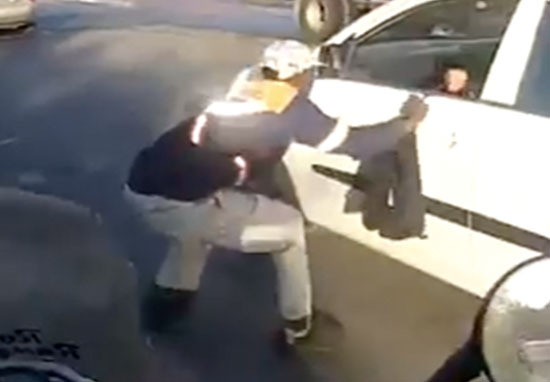 I’m not sure entirely what the robber was thinking when he tried to get away with robbing a car in the middle of the road, in broad daylight, while wearing a reflective jacket – a product literally designed to draw attention to you. Needless to say, his plan did not work out for him. 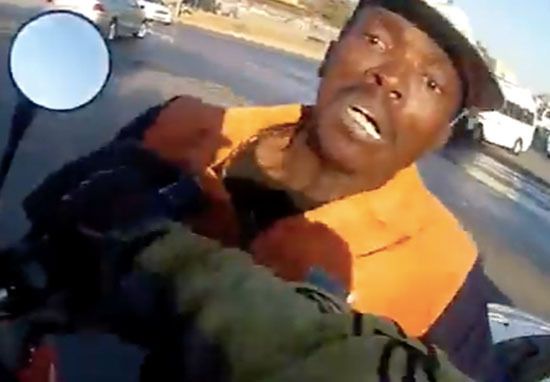 Footage of the scene was shared by a motorcyclist named Anton Damhuis, who was next to the car the man attempted to rob. After witnessing the whole situation, Anton made sure the man got his karma. Anton was commuting through Alexandra, north of Johannesburg in South Africa when he spotted the robber trying to pull a bag from the white car, while its driver tried desperately to hold on to it. Recognising the man was attempting robbery, the man behind the camera drove over and pinned the thief against the white car, ramming his bike into him. The man in the reflective top fell to the ground, but managed to get away and ran down a road before disappearing from view of the camera. In hot pursuit, Anton turned his bike around and weaved through traffic after him. The bag had been dropped on the ground near the white car which had since pulled over in the road. A member of the public tried to hand the bag to Anton, but he explained it belonged to the man in the car. Anton asked the driver if he was okay, but he didn’t give much of a response. The heroic motorcyclist shared his footage on YouTube on Monday, and it has since received almost 250,000 views at time of writing (Wednesday, September 12). I was on my way home and saw this smash and grab. Decided to intervene. Short video if the incident. Some viewers commented on the driver’s lack of thanks, but one man named Phillip Coetser actually claimed to be the driver of the white car, and took the opportunity to give Anton his well-deserved praise. My friend, I was the man in the car and I want to really thank you for intervening. Sorry I did not thank you yesterday, but I was in a bit of a shock. I eventually ran over him with the car (and unfortunately my laptop). Pity you did not see that ’cause I think you would have enjoyed it. I decided to intervene by pinning the man [in the reflective vest] down with my motorbike. I just think it’s wrong that people get away with this type of stuff. Anton is a real life hero!